I've just been writing a piece for The Reader magazine on the political aspects of Pasolini's Il Vangelo Secondo Matteo. I'll hopefully post that article here in time, but for now just one observation that I picked up watching bits of it tonight. The observation comes in part from thinking about Pasolini's politics and part from reading Mark Goodacre's thoughts on Matthean phrases that occur in the double tradition. Anyway, throughout Matthew the harvesting imagery is fairly prevalent. So it was interesting to notice that as Jesus leaves the wilderness, the first people he encounters (albeit passing them in the field) are a group of men with winnowing forks separating the wheat from the chaff (c.f. 3:12). This is to be a key theme in the ministry of Jesus the film portrays. On a related note, last month the Guardian did a number of Top 25 film lists, and this film ranked number 10 in the Top 25 Arthouse Films and, as a result, got a new write up by Andrew Pulver. It's a good summary though I must admit I prefer Derek Malcolm's review for the same paper from ten years ago. The BBC have just released their press pack for next month's The Nativity. There are still no dates for the broadcasts, although in the interview for the press pack writer Tony Jordan says it will play in prime time the week before Christmas. There are also interviews with Tatiana Maslany (Mary) and Andrew Buchan (Joseph), as well as Al Weaver who plays Thomas the Shepherd. I've written a piece previewing this production for rejesus.co.uk and there was a brief mention of it in Monday's Daily Telegraph. Christianity.org.uk has a couple of extra photos, including one of Peter Capaldi. As regular readers will know, I teach a course which tackles a different book of the Bible in order each month. The last three months have seen us discuss Matthew, Mark and Luke a key part of which has been the Synoptic Problem. It actually works fairly neatly. In the first session I introduced the idea of the Synoptic Problem without going into solutions, and we looked at how Matthew might have adapted and added to Mark. The next session enabled us to go into the two main options over which book came first, and I put the case as to why I believed in Markan Priority. The final session, therefore, allowed me to go into the last stage of the problem, and the existence of Q. One of the things Mark Goodacre dislikes is the way many people give their solution to the Synoptic Problem (usually Markan Priority and Q) before ever presenting the evidence around it. Since I agree with Mark's principle, I thought it was important to present the questions around the double tradition as neutrally as possible (whilst still, ultimately, giving my own opinion). What this led me to, however, was the realisation that there are actually three possible explanations to the double tradition (assuming one accepts Markan Priority as we had established last time). The most well known of these is that Matthew and Luke worked independently using a now lost source (Q). Goodacre also argues for the possibility that Luke knew and used Matthew. But, theoretically at least, there's a third possibility: that Luke was written first and Matthew used it as a source. What surprising is that not only does no-one appear to believe in this option, no-one even gives it any consideration. Indeed in trying to draw up a list of arguments for and against, I had to devise/derive them all myself. That in itself, is obviously one argument against, but I also managed to come up with some more based on the texts than scholarly consensus. I came up with two main types of argument "for" the idea that Matthew used Luke. The first are those that are also used to support Luke's use of Matthew. So into this camp fall arguments for simplicity, lack of evidence from church tradition for Q and the major (Mark-Q overlaps) and minor agreements. The second group were harder to come up with as I couldn't just borrow them as I had done with the first type. One of the arguments here is the idea that Luke is more primitive than Matthew. In honesty, I offered this one with the large caveat that I was only aware of a couple of prominent examples ("Blessed are the poor in spirit" and "Our Father in Heaven") and had no idea how representative they were of the differences between Matthew and Luke in General. But if Farrer theorists can argue away the "alternating primitivity" argument from their side , then it was possible that the same might be ture from this side. The next argument was that Matthew's theology is more developed than Luke's. The example I cited was the church discourse in Matthew 18, but a case could also be made for the apologetics we find after the resurrection, not to mention the corpses raised from the dead at the point of Jesus' death. Lastly I argued that since Matthew's structure was the most developed (5 key discourses mirroring the Torah) that this also would support the theory that Matthew wrote last. When it came to the arguments "against" I could only find two (aside from critical unanimity against), but they were fairly decisive. Firstly, the fact that Luke is almost never the middle term in the triple tradition. Most of the time its Mark. Not infrequently it's Matthew. It's almost never Luke, which is not what we'd expect if Matthew had used Luke. The second main argument is that of editorial fatigue. When one double tradition author tries to adapt the other but lapses back into the original wording it's always Luke failing to coherently adapt Matthew, never the other way around (despite frequent instances of editorial fatigue when Matthew is using Mark). That said, there are relatively few examples here (at least that are cited in Mark Goodacre's paper), and even then not all of them are convincing. (In the case of Matt 13:16-17 / Luke 10:23-24, whilst given the broader trend of Matthew to Luke this seems the most feasible option, it's not beyond the realms of possibility that Matthew was tidying up Luke rather than vice versa). Having done the session on Monday I returned to the question of the minor agreements as I had argued that fairly poorly (having forgotten some of the details) and did, in fact, uncover an argument against from another piece by Mark Goodacre. Here he argues that the language used is so typically Matthean in certain passages of the double tradition that it's hard to ascribe it to anything other than Luke using Matthew. Ultimately, I still hold to the Farrer theory, but it seems strange that there is so little material exploring the possibilities in the direction of Matthew's use of Luke. Does anyone have any others, for or against? One other point I wanted to raise, apt for this time of year, was regarding Luke supposedly erroneous citation of Quirinius's census. I didn't research this thoroughly at all, but in the main it seemed to be taken as read that because Josephus disagreed it was taken that Luke was wrong. I wanted to ask, are there any other sources for this verifying Josephus, and if not why is it so widely accepted that he is right? Can anyone help me with this? Even most of the conservative arguments defending Luke seem to accept that Josephus is right, resorting to arguments over the precise wording to defend Luke. Over at Arts and Faith, Peter Chattaway has linked to news from NYmag.com about two new Moses films in production by major studios. I reported on Fox's plans for a 300-style Moses film last year, and the NYmag piece doesn't really add much to what was known then. However, the Warner Bros. project, is something that neither Peter nor I had heard of before, and seems to have a reasonably strong team behind it. Dan Lin (The Departed) and Matti Leshem are going to be producing the movie and British screenwriter Stuart Hazeldine and US writer Michael Green (Heroes) are said to be supplying the script any minute now. There are a few more articles on this story available via this IMDb page, but I doubt any of them beat NYmag's headline. First-class pun-ditry. 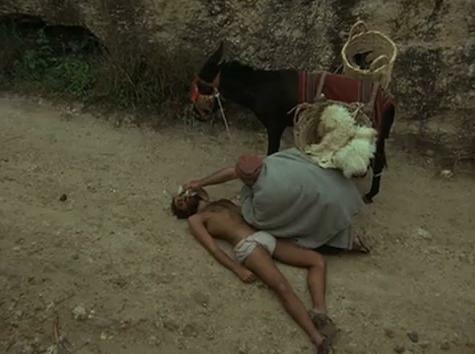 I was sorry to hear of the death of Dino De Laurentiis, producer of Barabbas, La Biblia and a few other minor Bible films. It was only last year that I reported on the celebrations for his 90th birthday. De Laurentiis produces over 160 films including the Hannibal series, Conan the Barbarian, Flash Gordon and Fellini's La Strada, but I will remember him for The Bible: In the Beginning. 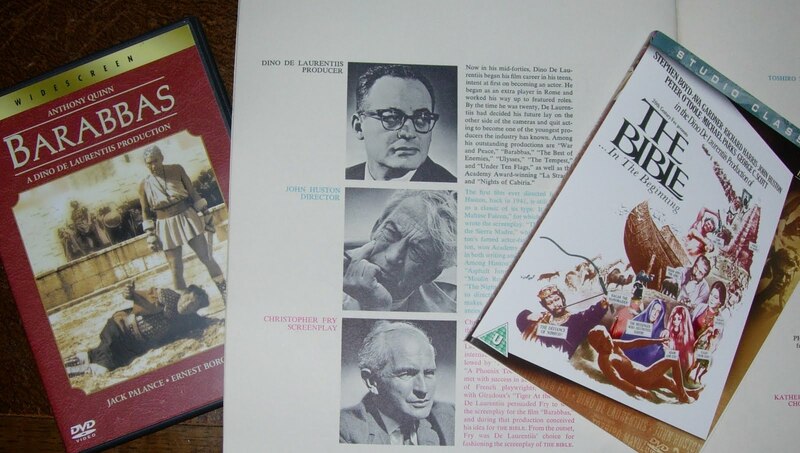 It was a pivotal Bible film for me and one which contains some of the best ever scenes from Bible films. 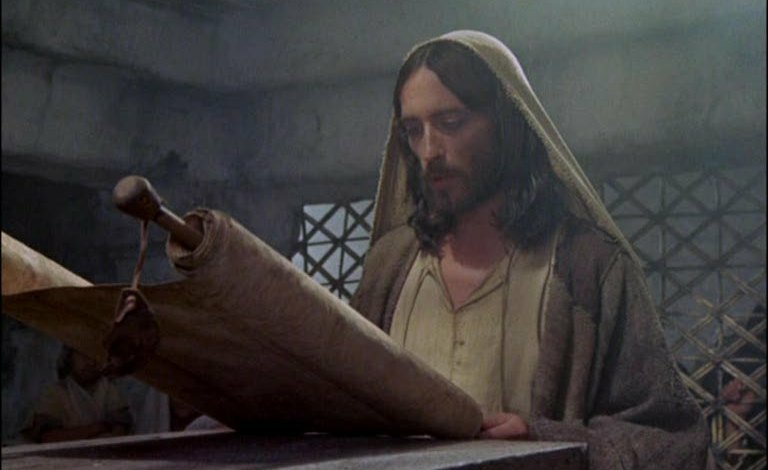 Last week I looked at various Jesus film portrayals of Jesus' Gospel Manifesto from Luke 4, as part of trying to find a suitable clip for a session on Luke I'm taking. I also want to include a clip of the Parable of the Good Samaritan, so I thought I add a few notes here as well (times indicate the point at which the relevant clip begins). Whilst Ray's Jesus is one who speaks about "peace, love and the brotherhood of man", the story part of the Parable of the Good Samaritan is missing. All that is left if the question "I'm a camel driver, who can I call my neighbour?" and Jesus' answer "He to whom you show mercy and compassion, whether you know him or not. This is all part of the Sermon on the Mount scene. One of Godspell's strengths is the way it creatively re-tells the parables, reflecting the fact that when Jesus first spoke them there was a freshness and vitality about them. Here the Godspell trope act out the story with their hands. There's a slight change to the characters here, We get a priest, a judge along with the Samaritan, rather than a priest and a Levite. Curiously however there's a suggestion that the Samaritan is drunk. At the end of the parable, the Samaritan is then hoisted onto someone's shoulders and paraded along until Jesus interjects with Matt 6:2-5 ("So when you give to the needy, do not announce it with trumpets..."). 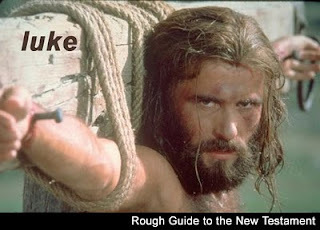 This is the only film to show Jesus telling the parable in standard fashion. 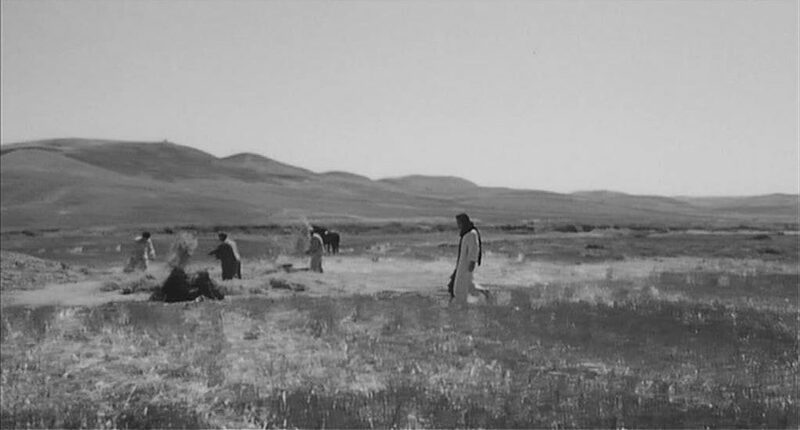 In fact it's a fairly unremarkable sequence, in keeping with the off-hand way Rossellini has Jesus deliver much of his teaching. Sorry I didn't note down the starting time for this one. Jesus (1979) - 60:48This was, for me, the most memorable moment. Initially we see Jesus being questioned as per Luke, but then there's a watery dissolve into a dramatised version of the story. It's wordless, accompanied instead by a incredibly memorable little jingle, before we dissolve back to Jesus and the crowd. A couple of points here. Firstly, all three of those who approach the beaten man do within a very short period of time. This keeps the story brief, but it does rather let the first two off the hook to a small extent. The road looks busy, so the hurrying by looks less like desertion and dereliction of duty than it looks like simply leaving it to someone else. Secondly, here it's a woman who asks Jesus the initial question rather than an expert in the law which makes the scene softer and less confrontational. Likewise it's a young girl, not the original questioner, who answers Jesus' closing question, leading Jesus into "suffer the little children" passage. This version has Mary telling Jesus the story as a boy in keeping with the high view of Mary the film has. Jesus ends by asking "so the Samaritan was good?" to which Mary, rather curiously replies "yes, even though he was a Samaritan". The scene following this one links in, showing Jesus getting beaten up by a group of boys but refusing to fight back. This is one of the sections in this puppet animated film that switches to 2D, hand drawn animation, and it's done in a rather angular spiky style, which might actually be quite scary to younger children. It also explains some of the cultural reference points such as how the priest believed it made him unclean to touch a dead body, the Jewish people's hatred of the Samaritans (even showing one the children shouting out that he hates them). In the context of the film this is probably my favourite portrayal, but for a free-standing clip I don't think it would work so well. Tom Wright’s New Testament "...for Everyone" series of Bible commentaries have proved to be very popular, so it was only a matter of time before someone decided to try the same approach for the books of the Hebrew Bible. Step forward John Goldingay, professor at Fuller Theological Seminary in the US and former principal of St. John’s College Nottingham (UK). Having dealt with the first sixteen chapters of Genesis in volume 1, Goldingay, along with SPCK - who are also the publishers of the Wright series - have moved onto Exodus and Leviticus for the second volume. Part 3 - Numbers and Deuteronomy - is due out in the UK later this month. As the series’ title suggests, its aim is to give an overview of the books that is accessible to all-comers. Like Wright’s series, and William Barclay’s similar series from the middle of last century, Goldingay offers his own translation of each passage before attempting to summarise it, typically offering personal anecdotes to enlighten often obscure parts of the Old Testament. Some of these stories work better than others. At times the links are a little too tenuous, or require such a deal of explanation that the advantage gained is fairly minimal. That said, they did draw me into the explanations that were to follow, and give me a greater appreciation of the author and his life. Goldingay’s translation, on the other hand, sustains a real freshness throughout. I don’t know a word of Hebrew, so I can’t vouch for the legitimacy of his choices, but they are often bold, causing certain nuances to leap out. Part of this is because such a large proportion of popular translations are essentially re-workings of the King James Version, but even the choices made in translating individual words give a new angle on familiar passages. It’s a shame that not all of the text is translated - often one part of a passage is translated whilst the other is merely summarised - but this is understandable given the nature of the project, and the length of the Old Testament relative to the New. The difficulty in housing Exodus and Leviticus under one introductory roof is that typically most people are far more familiar with the former than the latter. In particular, many of this book’s target audience will have grown up with the stories of Moses and the exodus from Egypt. It’s difficult therefore to provide an introduction to Exodus which is consistently both accessible and informative. Most readers turn to commentaries seeking fresh insights, and whilst I recognise that Exodus is one of the books I have studied in more depth, I think the average church-goer, at least, will have heard much of this in one forum or another. Whether this is his failure, or merely a small flaw in what is a strong concept overall, I remain unsure. Leviticus however is entirely another matter. Here, and to a lesser extent in the later chapters of Exodus, Goldingay’s work is excellent, managing to explain one of the Bible’s most impenetrable books in a way that makes it seem fresh, accessible, and, dare I say it, fascinating. Time and time again I came away feeling that I had gained a whole new perspective on the book and it’s implications for today. 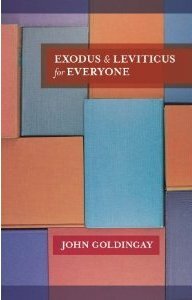 I’ve only dipped into commentaries on Leviticus before, but I feel I would recommend Goldingay’s work here to all but the most seasoned Torah-expert. Given that the average Christian gives a wider berth to the majority of the Hebrew Bible than a fictional Levite on the Jericho to Jerusalem road might give to a heavily beaten man, the outlook for the rest of the series looks promising. That said, one of the problems with working through the Old Testament in order, particularly for a series that aspires to being wide reaching, is that the first few books contain a number of hurdles that risk alienating large swathes of readers. Genesis is the first - your take on creation will often cause some readers not to progress. This second entry in the series again it comes into contact with a number of controversial texts: how will the author handle God’s violence against the Egyptians in Exodus or the verses often cited from Leviticus as being anti-homosexuality? On the first, Goldingay seems a little troubled by Exodus’ anticipation of the conquest of Canaan, covering the issue in his section on Ex. 23:20-33, but ultimately he’s seemingly content to accept the text’s reasoning. But the anti-homosexuality verses (18:22 and 20:13) are passed over. It’s possible to infer Goldingay’s take on the issue from his careful explanation of how similar passages function, but not to dealing with this issue specifically is an error. Whilst it’s no more than a passing reference as far as Leviticus is confirmed, in our culture this is Leviticus’ most well known / discussed verse (as any search engine will quickly confirm). To ignore these verses in a commentary aimed at the average person on the street is undoubtedly something of an oversight. Another omission that will surprise many experts on the Hebrew Bible is the absence of a detailed discussion of the documentary hypothesis and the hypothetical sources behind the text. Goldingay makes a number of passing references to there being various sources behind Exodus, particularly when there seems to be some kind of conflict between them, but he avoids mentioning JEDP, Graf-Wellhausen or redactors. Whilst this is unusual, I think it’s the right call. Opinion on the sources behind the Pentateuch have become so diverse over the last century that there is very little consensus. 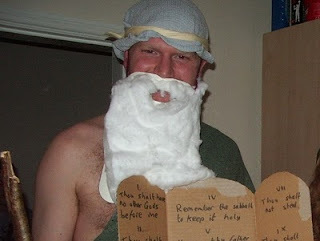 Indeed many of Goldingay’s target audience will come from backgrounds where it is still widely agreed that Moses wrote the Torah almost single-handedly. To wade into such a complex issue would risk alienating many of the “Everyone”s who might choose to read the book. It could be argued that at least mentioning J, E, D and P might be useful, but again, if there’s to be no specific analysis of those sources, then simply explaining that there different sources seems a wise approach. Goldingay’s approach to this issue typifies the way that the book consistently pitches things at the right level. Whilst this arguably leaves the Exodus section of his commentary seeming a little pedestrian, it results in a superb and insightful explanation of Leviticus, and the translation means that even without the commentary more seasoned students of these two books will find plenty to chew on. This week's The Culture Show on BBC2 featured a short piece on the 40th anniversary of the release of the original 'Jesus Christ, Superstar' album. Such was the popularity of Rice and Lloyd Webber's concept album it was only 3 years until it was adapted for the film. The programme includes an interview with Rice and Lloyd Webber as well as a closer look at the artists involved in the original recording including a few excerpts from Murray Head (Judas). Viewers in the UK can catch the show on iPlayer. Everyone else will have to satisfy themselves with listening to the original album on Spotify's smarter younger brother, we7. 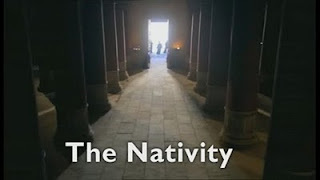 On Thursday I picked up on a post from Mark Goodacre about a soon to air programme from the BBC, The Nativity. I got an email shortly afterwards from Raspberry Rabbit and an anonymous comment telling me towards an interview with the series' writer Tony Jordan from this year's Churches Media Conference. You can listen to the mp3 at Raspberry Rabbit's blog. Thanks to both of them for pointing me towards it. This seems to be exactly the same forum that Nigel Stafford-Clark was interviewed at in 2007 in the run up to the BBC's The Passion. This is further evidence to support Mark's theory that this production will be very similar to that one. 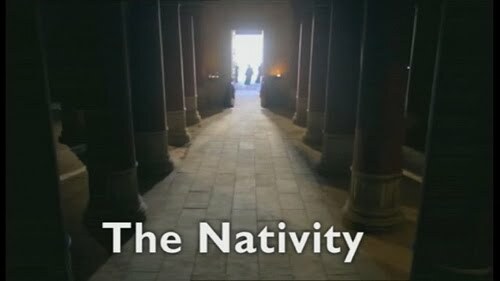 Mark Goodacre has just unearthed news of a new BBC drama called The Nativity which will (presumably) be going out this Christmas. I'm a little surprised not to have heard anything about this before. Mark links to a BBC press release from April which was quickly picked up by both The Telegraph and The Guardian and, of course, the BBC's own website. Top billing seems to be going to The Thick of it/In the Loop's Peter Capaldi who will play one of the wise men (Balthazar). Quite how much screen time Capaldi will get remains to be seen. The programme, which will be shown in four parts, will "focus on the love story between Mary and Joseph and their 'emotional turmoil' over her pregnancy".1 I can't help but think that, come the broadcast, I might find myself hoping that the wise men will get sufficiently lost to enable Balthazar to really lose it. But in all seriousness a more restrained performance is probably what he needs right now. Other actors include Art Malik as Nicolaus, Andrew Buchan as Joseph, Tatiana Maslany as Mary, and Vincent Regan as Herod. I've long been a fan of Malik's and thought he would be well suited to a role in a Jesus film. 2010 has obviously been his year for that: he also features in this year's Ben Hur. Buchan was good value in Cranford and I suspect he'll be a good, if a little traditional, Joseph. I thought Maslany and Regan were both new to me, but Maslany provided a voice in Eastern Promises and Regan has good epic-film form having had smaller parts in Troy, 300, Jeremiah, Clash of the Titans and Joan of Arc/The Messenger. The Nativity has been written by former Eastenders writer Tony Jordan. Three years ago Jordan revealed, in an interview with The Guardian that he'd been working on the script for two years, which means that it's been a five year project for him. Stark contrast with Mike Rich who penned the script for The Nativity Story in just 6 weeks (although had researched it for a year before hand)2. Jordan's Red Planet Pictures are producing and there are a few pictures showing there on their page on the programme. The first photograph here appeals to me more than the second. The blue dress gives a strong nod to tradition, but a weaker nod to historical probability. I think I prefer the grittier approach to the material as found in the earlier parts of The Nativity Story. Mind you all that had evaporated by the time baby Jesus arrived so it's not a fair comparison, and this is just a publicity shot, so I'll withold judgement until I've actually seen it, particularly given so many of the other quotations surrounding the film seem so positive. All in all it seems that this film will be something of a prequel to the BBC's The Passion (2008). Certainly more in that direction that The Liverpool Nativity from 2007. Hopefully I'll be able to find out a bit more about this over the next few weeks. Roll on Christmas. I want to use a clip to illustrate Luke's portrayal of Jesus' rejection in Nazareth (Luke 4:16-30). Luke is the only gospel to depict Jesus reading a particularly apt text from Isaiah which narrows my focus somewhat. Whilst a few more versions of this episode are out there I'm going to focus on those below as the quality of the other films overall is too poor to make them a serious possibility. So these are those listed in Staley and Walsh from which I will also cite start times and chapters in brackets (Region 1). The unbracketed timings are my own (Region 2). I've excluded Pasolini and Saville's films here as they are based on the accounts in Matthew and John respectively. I've also included the scene from Mary, Mother of Jesus which is not included in Staley and Walsh's book. This takes the scene almost directly from Luke alone. There are a few dramatic flourishes, but the location of this clip (right at the start of Jesus' adult ministry) and its inclusion of the fulfilled OT prophecy both suggest Luke. After Jesus has made his statement, Mary repeats the key phrase "today in our hearing the scriptures are fulfilled". We also see Jesus being ejected from the temple and there's a similar shot of Jesus' back as was found in Greatest Story. This time however no stone is actually thrown. This is certainly the version that came to mind when I started thinking of portrayals of it and so I may well use this one. This film is usually pretty dreadful, but Bale is capable of turning any scene into something memorable so I thought this might be worth a try. And so it turned out. There's a bit of an underemphasis on the words Jesus speaks, but a few nice touches. For example, as Jesus is reading from the scroll another man moves a pointer along the text to help him keep his place. When Jesus begins to close the scroll in the middle of a section the man gives Jesus a shocked look. The confrontation that ensues goes on quite a bit, but it's still a fairly good scene. There's also a visual nod to Jesus of Nazareth as we see Jesus in the synagogue from behind the screen that separated off the women. Overall it's interesting that other than Greatest Story all these portrayals are keen to show Jewish customs relating to synagogues. All 3 of these other films also join up the dots for the audience by explaining that Jesus was claiming to be the messiah. A while ago I mentioned in passing my brother Geoff Page. On top of writing musicals (such as one on Burke and Hare which played at the Edinburgh Festival a year or two back long before the current film version) he also occasionally accompanies silent films. This Friday Geoff is providing a live accompaniment to two Alexandr Dovzhenko films in Cambridge (UK). I'm trying to see if I can get there, but the 7pm start will make it a bit tricky. 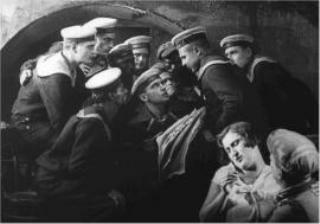 The films he'll be playing along to are 1926's Yagodka Lyubvi (Love's Berry) and the following year's Sumka Dipkuryera (The Diplomatic Pouch). Together they last about 75 minutes in total. The films will be showing at the Cambridge Arts Picturehouse which rather disappointingly has an extensive write up for it's screenings of Peppa Pig but no information on these rare films. There is however a promo video which contains some footage, as well as a facebook event page. Incidentally, Geoff and I have talked about doing a silent Bible film event together - him doing the playing and me doing the talking, so if anyone would be interested in putting something like that on, please let me know. I know I quite often find myself apologising for longer periods with no new posts, but I think my recent hiatus has been the longest since I first started this blog almost 5 years ago now, so sorry! Annoyingly it's not for want of content - I have stacks to post about and hope to resume normal service shortly - it's just been a bit crazy over the last fortnight. Thanks to all of you who have sent me bits and pieces of news I hope to get them up shortly. Please do keep them coming. Apologies also that I've not replied to any emails or comments lately. I hope to get onto that shortly as well. Lastly, my last post here was all about using video clips in PowerPoint presentations. Well, I should have that the moment you think you have got something sorted and start telling people about it something pops up to prove you wrong. And so it proved. Days after making the post I tried to use a clip from Life of Brian and one from Jesus (1979). I could have done these using clips from youTube in the manner described but I decided to aim a little higher, go for the second method and found it was a little trickier than I had imagined. In the end I did both, but (for some reason) I had to do my trimming in Windows Movie Maker which is now free to download. It's not great for making your own films, but it's another way of doing this when other programmes mysteriously don't work. So sorry to anyone who tries what I talked about last time and found it hard going. I'll be reply to the comments on that thread as a matter of priority.